Our biases can make us do silly things. Our biases can also be leveraged to influence our decision-making. The best sales professionals and marketers understand how important it is to study human psychology and use that knowledge to create stories, messages and strategies that drive results. Psychological or cognitive biases are subjective perceptions that we fall back on as we process information. Whether you realize it or not, many of the decisions you’ve made over the course of your life have been swayed by such biases. Some biases are harmless and even comical; others can be costly. We connect with images much more deeply than we do text. Yet sales teams often give presentations with slide after slide of nothing but text—no charts or visuals to support what’s being said. In countless studies, scientists have found that images are easier to remember. So when pitching to prospects, strive to replace the text in your presentation with graphics. John Medina, the author of Brain Rules, reveals that “multi-tasking, when it comes to paying attention, is a myth.” People have a really hard time reading and listening at the same time. So don’t force them to do it. Give them visuals that they’re more likely to remember. Embrace the idea of communicating with graphics instead of solely communicating with text. The bandwagon effect is what we call it when people buy a product, adopt an attitude or embrace a certain behavior simply because everyone else is doing it. As more people follow the trend (e.g., Crocs, Meerkat, pet rocks, etc), others are inspired to hop on the bandwagon. We’ve seen the bandwagon effect work wonders for account executives using SalesRight to highlight one pricing tier over another. The price point labeled as the “Most Popular” or a “Top Choice” consistently generates more engagement than the others. There’s an old question in advertising: How do you sell a $2,000 watch? Put it next to a $10,000 watch. Anchoring is a cognitive bias that says we rely heavily on the first piece of information we’re offered (in this case, the anchor price) when making decisions—meaning, we use the initial price as a benchmark, regardless of how high it is. On one end, they have the Lightning Unlimited plan that is double the cost of the Lightning Enterprise plan and 12x more expensive than the cheapest plan. The anchors at both ends ($25 and $300) of the pricing tiers make the buyer feel that the middle options are actually the best. The Essentials package doesn’t offer nearly enough value at $25, while the Unlimited plan seems so expensive that it makes the $150 plan look quite affordable! In reality, studies have found that buyers will pay more if the price tag shows a precise number rather than a clean, rounded number. For example, $354,294 is more likely to appeal to a buyer than $350,000. In a study conducted at Cornell University, researchers found that people judged precise prices to be lower than rounded prices, even though the precise prices were, in fact, higher. We have a clear bias against nice round numbers in higher-priced transactions. So as you craft your proposals and communicate prices to enterprise clients, keep in mind the influence that precise prices will have on buyers’ perception of value. We’ve all seen this happen in the workforce. You make a serious investment in a project, but the project is struggling. Or maybe you’ve got a successful project, but leadership believes it could do even MORE with a bit more investment. For years, organizations have faced situations like this, and they’ve found it challenging to pull the plug as described in a 1987 essay in the Harvard Business Review. Why does this phenomenon happen? It’s a cognitive bias called the irrational escalation of commitment. It’s the same bias that drives people to buy lottery tickets over and over and over again. We’re hardwired to believe that after we invest in something once, our chances of success go up. We think that adding a little bit more money to a problem can fix it. We think that adding a few more licenses to an account can accelerate growth. We think that buying one more add-on will increase our ROI. This bias is something that sales teams and marketers can leverage. It’s something that they can use to increase the lifetime value of their clients and impact the bottom line. Make it easy for upsells. As a buyer is going through the checkout process and purchasing your solution don’t hesitate to include opportunities where they can add a simple $20/Mos add on to their plan. Embracing a call to action like this after they’ve already selected a larger plan – they’re more likely to continue adding perks to their order. 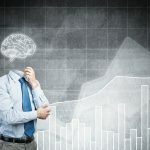 There are tons of cognitive biases that can shape your sales strategy. Take a look through this visual study guide. Become familiar with the key cognitive biases that affect your buyers (like the ones in this list) and use that psychological insight to design pitches, display prices and create great proposals. You’ll soon see how leveraging these biases can increase sales—and you’ll become more aware of your own biases so your brain won’t play tricks on you.